Desk Planner Calendars are a smart way to organise your work and at the same time be able to come back and have a look at your plans any day throughout the year. You might be thinking you're pretty light on work since you have nothing due the very next day, but your custom desk planner calendar can you the harsh truth being the fact that the rest of the days of the week are quite full actually. Huge as it is, you can use our custom calendars so as to have personal events and business assignments in the same place. Never forget grabbing a cup of coffee with a friend or the meeting with your boss tomorrow in lieu of your work taking up the whole space. Custom desk planners imprinted in white, gold or silver foil with your company logo and message leave a lasting impression all year long. 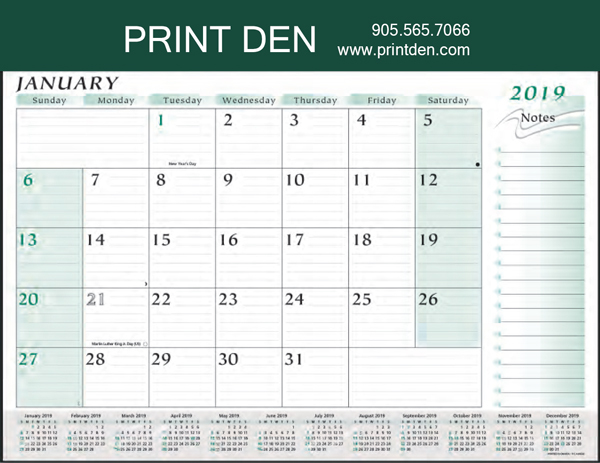 The 12 month calendar comes fitted into a green or black vinyl pad holder. The size of the planner is 22.625" x 17.75" with imprint area of 8" x 1.75". These are available in English or French. We can also provide mailing boxes for these calendars. Insertion services also available. Need a custom type? Contact us for a custom quote. - Select Size - 22.625" x 17.75"